Since 2007, at least fourteen inmates incarcerated in various TDCJ facilities across the state of Texas have died from extreme heat exposure while imprisoned. TDCJ inmates and many TDCJ personnel are exposed to dangerously high heat levels on a regular basis. This practice violates individuals’ human rights, particularly the rights to health, life, physical integrity, and dignity. The HRC published a report entitled “Deadly Heat in Texas Prisons” in 2014 revealing the ongoing, dire conditions that inmates and guards alike are exposed to in Texas prisons. Another report, “Reckless Indifference: Extreme Heat in Texas Prisons,” in April 2015, expanded on the Clinic’s previous work by adding inmate testimony as well as inmate grievances, and establishes that pleas to the Texas Department of Criminal Justice (TDCJ) were largely ignored. The HRC concluded that extreme heat in prisons endangers the health of inmates and employees, that such conditions are a violation of inmates’ constitutional and human rights, and makes short- and long-term recommendations on how to solve this unacceptable, ongoing problem. 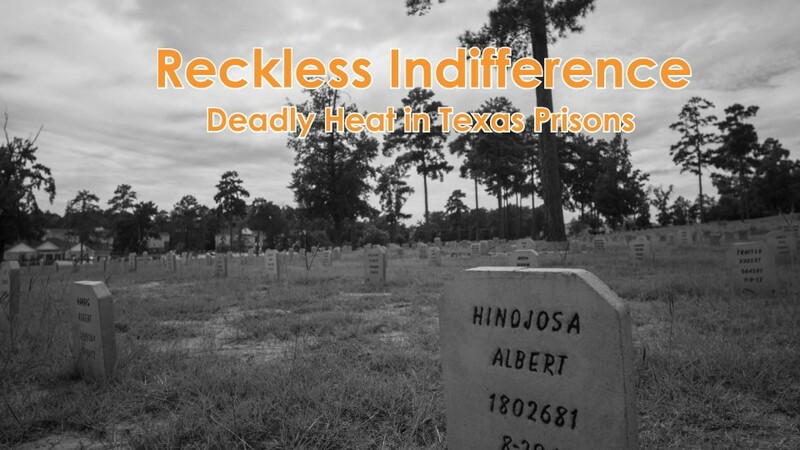 Upon publication, copies of “Reckless Indifference” were mailed simultaneously to over 500 contacts, including rights advocacy organizations, TDCJ officials including 81 prison wardens, 46 prison inmates, at least 50 journalists and news outlets, 183 members of the Texas State Legislature, 89 judges, and many others. Clinic students present the Human Rights Clinic report “Deadly Heat in Texas Prisons” before the Interamerican Commission on Human Rights on October 27, 2014.